Summer is finally here and they are going to be thrilled when they receive this beautiful Summer Gar..
Our Elegant Expressions gift basket is just that, Elegant. This beautiful basket has a great assor..
You can be proud to send this elegant masterpiece and they will be thrilled to receive it. The Ber.. Send them this gorgeous gift basket that is sure to make a wonderful impression. The Beringer Foun..
You can feel proud to send this magnificent gift basket and know that it is going to be well recei.. This California themed gift tower makes a grand impression for the Holidays. Three glittering boxes .. Your own California wine tasting awaits along with a bevy of sweets and treats. Sit down to 3 bottle.. Here in the Golden State, sun-kissed rolling hills are covered with grapevines as far as the eye can.. They are going to love to receive this bright and cheery two bottle gourmet wine gift basket for a.. This symbolic Patriotic BBQ Themed Wine Gift Basket will make a great addition to their picnic tab.. This basket is sure to make a huge first, second and third impression. The 'Chateau Tanuda Gra..
They’ll raise their glasses and make a toast to you for sending the perfect gift. A mouthwater..
Red wine lovers will delight in this splendid Chilean Red Duet Wine Gift Basket that features the ..
Any chocolate craving they had will be out the window when they receive this delectable Wine and C.. There is no better holiday gift than this elegant three-tiered natural boxed gift tower filled with .. Send your best wishes for any occasion with this elegant gift of wine and cheese. Perched atop a sol..
Help them celebrate their birthday this year with this delicious and fun 'Cupcake Vineyards.. Send them ''Elegant Wishes'' with this gorgeous Champagne and Gourmet Food Gift Ba..
You are going to love to send this basket as much as they are going to love to receive it. The Est.. Send this bright and cheery 'Flip Flop Pinot Grigio' Wine Gift Basket for any occasion. Th.. 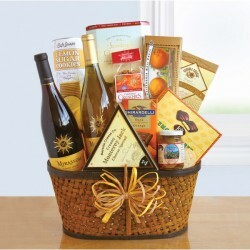 They are going to love to receive this bright and cheery Wine and Snack Gift Basket. The Flip Flop.. Send a generous collection of California Wine Country favorites. Three fabulous wines – a char..
Three bottles of delectable wine, a cabernet sauvignon, a chardonnay and a rich merlot are featured .. This magnificent basket makes a giant impression. Four outstanding bottles of fine California wine, .. Send your favorite "Dead Head" a gift basket that is sure to ROCK by sending them our Gr..